Game in active development: modes, maps, skills, armor, weapons. -Duel PvP mode against players on the same device. The enemies will not give you the slope, only your speed and accuracy will help you survive.Archer can use his bow and arrows that would kill other archers,arrow hit in the head gives extra coins. In PVP mode you duel with another can shoot each other from a bow until strongest archer does not win, it uses the system rounds. -For a shot, press your finger on the screen and hold down - your Archer will reach the arrow from the quiver behind him and put an arrow on the bow. -Now pull left (classic style) or right (alternative style) by choosing the strength of the bow tension. -Select a vertical angle for the shot and release your finger from the screen. -Arrow will fly along a hinged trajectory and hit an enemy archer. -For getting into the legs of characters, 1 life is deducted. -For getting into the torso characters are subtracted 2 lives. -For getting into the head of the characters - critical damage + more gold! -Your Archer can dodge the enemy's arrow! -Your Archer can shoot down an enemy! -You can choose the shooting distance in the "Dynamics" mode! -You are instructed to keep the secondary gate, which will attack part of the enemy troops. The main battle will be held at the main gate. If you fail, enemy troops will penetrate the city and the battle will be lost! -Your task is to hold out until reinforcements arrive, do not let them break the gate or inflict serious damage on enemy troops! -Prepare yourself for defense. Earn gold and hire troops! If you do not have the proper training the fight will be lost! We recommend to go into battle fully prepared! -Belove the enemy Archers and dodge their arrows in time! -Keep the arrow while dodging the enemy shot and the sight will be saved. 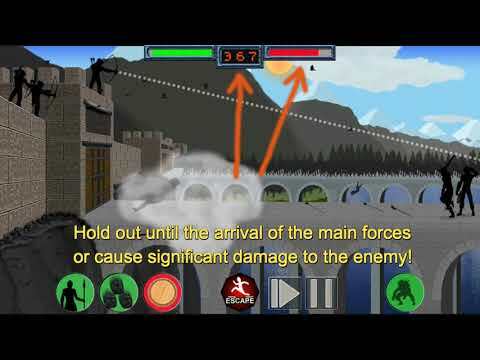 - Give commands to your troops and monitor the situation. -Try not to admit the enemy to the gate you and your archers will not be able to fire on them! -If opponents get close to the gate, order the infantry to use "Spears" or "Drop stones"! - To destroy several enemies at once order "Drop explosive". A barrel rolls out from the tower and rolls in the direction of the opponents. Your task is to shoot it with arrow and blow it up! The explosion will destroy everyone in the radius of defeat! -There are several training videos on this mode. -Your Hero will be killed. -The enemies will break the gate. Write your suggestions and wishes in the comments, we take into account the opinions of the players. In the future we plan to add new modes, and the improvement of old, as well as multiplayer modes and shop. Have fun and wait for new updates! In the current plans, add several cards to the modes "Castle" and "Duel".